Did you know the Naples Flower Show coming on March 22 – 23 is the largest flower show in Southwest Florida? It features healthy well-groomed plants*, spectacular floral designs, educational displays, and several demonstrations. *Please Note: There has been a change in the Making Music Schedule. See page 8 of the Schedule. Section P, Combination Plantings, WE ARE FAMILY, number 119 should read Terrariums instead of Troughs. Please make that correction. 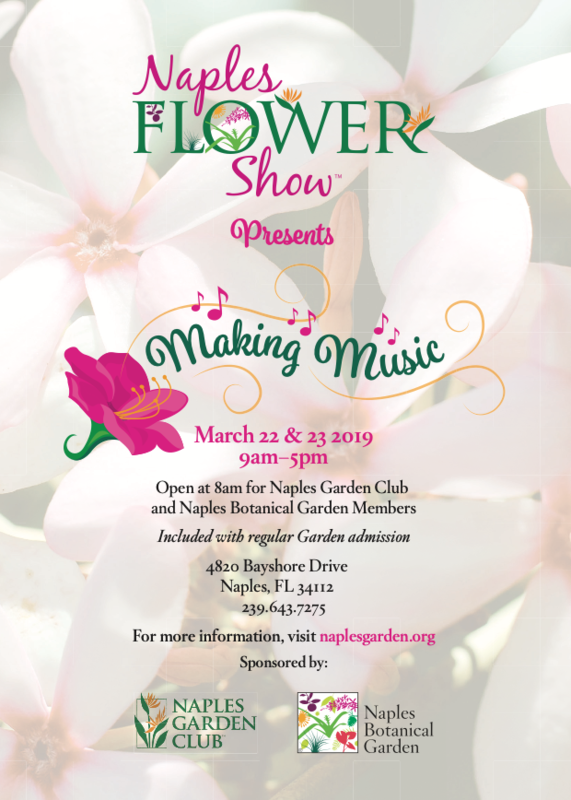 As a member of the Naples Garden Club, you will be a part of making our Flower Show a success by volunteering at the Flower Show, Making Music, by entering he Flower Show, Making Music, and by supporting and spreading the word about Making Music. Many hands make a job go quicker and easier. Volunteer – What Jobs Can I Do to Help at the Flower Show? Members can pick their volunteer spot. Just click on the yellow button to choose one or more volunteer opportunities with staging, hostessing and closing. Or, go on Naples Garden Club website and find the same Sign-up Genius button. Enter Horticulture – What Goes Through the Judges’ Minds When Looking at my Plant? National Garden Club certified flower show judges will use the 2017 Flower Show Handbook to evaluate the show. That is the big brown book we all received and put on a shelf. They will consider Conformance, Plant Identification, Peak of Perfection and Grooming and Staging. WHAT??? Check out pages 100 to 105 in the 2017 Flower Show Handbook to see what that all means. Better yet, come to the Horticulture Prep Workshop on February 27 to learn more. Click here to sign-up! Bring a Floral Design – How about if I enter a Floral Design in Design or Botanical Arts? The Judges will consider Conformance, Design, Selection and Organization of Components, Expression and Distinction. Help!!!! Check out pages 106 to 109 as you plan your exhibit. Talk to the Consultants of any Design or Botanical Arts Classes that interest you. Check your Making Music Schedule that you have received for those Design and Botanical Arts opportunities and consultants. Support – What else can I do to support my Garden Club’s Flower Show? Get a private viewing of the Designs and Horticulture, Botanical Arts, Education Exhibits the night before the opening of at the Flower Show by signing up for Making Music Preview Party at 6:00 p.m. on Thursday, March 21. Bring a guest, have some munchies and celebrate our wonderful finished product before the general public sees the Show. Register here for the Preview Party. Share the joy! Cut/copy and paste the flyer found at the top of the page and email it to friends, post it on Instagram and Facebook. Contact Mary Pulick if you can help distribute flyers. Be Proud of your accomplishments and those of your Club! Need more help? Page 2 of the 2019 Flower Show Schedule lists Divison/Committee Chairs that can answer your questions. If unsure whom to contact, send an email or call Flower Show Chair Mary Pulick at marypulick@gmail.com 734-476-2453.